IT IS regrettable to note that most of the people that have surrounded the UPND leader have either questionable background or have been architects of political violence, the Gallant Youth in Zambia have observed. He said there was nothing to celebrate about some individuals who were joining the party and scandalising where they were coming from because their motives were aimed at suiting their agenda. Mr Mulenga alleged that the dismantling of the ‘cartel’ in the Patriotic Fronts had found room in opposition UPND, who were thinking they were gaining popularity. 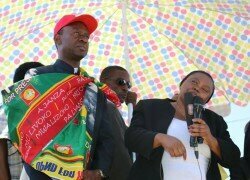 He cautioned the party to be wary of people who were only surrounding Mr Hichilema to fulfill their agenda. “Who will trust a person who is scandalising where he is coming from, but this is what we are seeing today,” he said. Mr Mulenga said it was unfortunate that the opposition UPND officials had continued to attack the Head of State, instead of concentrating on putting their party in order that has received various characters that were bound to prevent them from winning the elections because of their bad acts. “This is regrettable and surely confirms the fact that the opposition has run out of alternative ideas to offer as they claimed to be a government in waiting. “We expect our leaders never to talk ill of their political opponents,” he said.